Each brand in our natural living section has been selected as a partner in our endeavor to provide you the best products available. Please use our staff as your source for product information. We think they are the best. We believe this because they are constantly learning about the diverse products. Using our knowledge, research and extensive library, we can assist you the best possible choices you can make for optimum health. Be sure to check our events calendar or sign up to receive our newsletter to be informed for our great informational events. Our body care philosophy embodies the notion that what you put on your body is just as important as what you put IN it! Our entire selections of body care and cosmetic products are cruelty free. We’ve chosen those items that use herbal ingredients, plant oils and their derivatives whenever possible. Head to toe, we will have everything you need to look your best, naturally! Our lifestyles are more hectic and complicated than ever before. Our body’s reserves are constantly depleted by the demands of managing an ever-changing, always complex environment. Vitamins and Food Supplements can help restore and balance your body’s needs. We are dedicated to offering the best, most natural vitamins and food supplements available. The manufacturers test each product rigorously. We do not carry any synthetic vitamins. 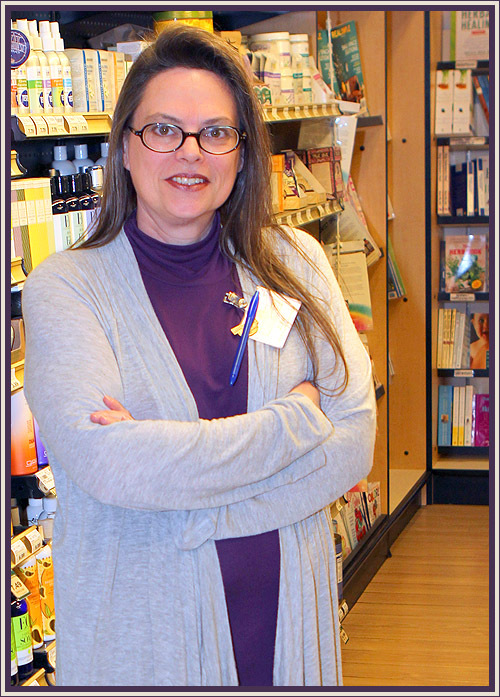 With over a decade of experience, Judi Miller, our Natural Living Specialist, understands how living naturally can make you look and feel your best! From finding superior all-natural cosmetics, body care products, remedies, and supplements to using the perfect essential oils for you, our natural living department will help you experience and practice the art of natural living.